And it seemed that my evening couldn't get any worse. First of all, I was having car trouble...something several mechanic type people were responding with "Damn foreign car...always something isn't it??" Which, I later learned, was easily translated to "Alternator". I swayed back and forth on the notion of staying home that evening, seeing as how I had no way to get to the La Luna. When suddenly lightning struck and I decided to hit up my friends Denise and Joe for a ride to the club. Then tragedy struck, once again, when we stopped to pick up our fourth party and he decided to make us wait for him so that he could finish with his own band's practice, thus making us miss Snapcase. Which, incidentally, was thoroughly disappointing seeing as how when we finally did arrive everybody had said they put on an outstanding show. When we arrived at the club, La Luna, we were promptly greeted and searched for any elicit substances, of which we had none. Once inside the club there was an air of cigarettes and cloves, and that smell of fresh washed clothes...you know, like right out of the drier. We entered right as Quicksand took the stage. They had a wonderful sense of who the crowd was and how they were doing. Their singer took full control of this and contorted his body in as many ways...he had us hanging on every last syllable that came out of his mouth. The rest of the band shared in this tenacity and played to the crowd, despite the fact that there was a serious, serious lack of a light show for this band. Which can, and does frequently, add to the flavour and mood of the concert. They had us spellbound. Did I mention how when the singer sang you knew he meant exactly what he was saying and you took it straight to the heart? Or how the guitar player wrenched every last note from his Les Paul, and how the rhythm section followed it all up with there melodic melodies? Next up was Deftones. I had seen them four times prior to this one and was looking forward to another great show. The first thing I noticed was that they brought along a total of two tour busses and semi-trucks, and it all became evident when the houselights dimmed and their theme music filled the room. A gloomy, moody light show ensued and one by one they took the stage. Stephen Carpenter started the show with a little ditty from the Deftones major label debut, "Adrenaline" (Maverick Records). The crowd reacted to his presence with a great roar of praise as the rest of the band filled out the rest of the music. Then, just on cue, right when you thought he wasn't going to make it onto the stage...Chino Moreno, Deftones great frontman, burst onto the stage. I felt myself get crushed as the entire capacity audience decided that they wanted to get to Chino and took it upon themselves to crush whatever lay ahead...in this particular case, it was me. The crowd gyrated with the music. People were packed so tight it felt like we were all the same person at times. Deftones roared through their first few songs and then threw the audience a surprise. They opted to slow down the music for just a song as they swayed through "Mascara" off of "Around The Fur" (Maverick Records). I was captivated at how Chino kept the intensity level so high while singing so low key and modestly. I was lost in his every word: "I feel soon I will sink into you. What do you think?, 'cause there's still blood in your hair and I've got the bruise of the year." And on it went into the next verse. 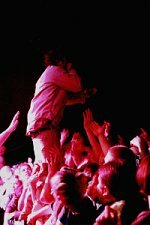 Rather than choosing to stay on the stage where all would be safe, Chino chose to stand upright on the barrier that separated the crowd from the stage. He stood there for an amazingly long duration...almost like a crow on a telephone wire. Did I neglect to say that we are only four songs into the set list at this point?? The intensity continually built with every song they played -- we all seemed so focused on Deftones and what they were doing. We were all so lost in their music. And as I became more and more lost in the songs, some big, sweaty, hairy, noisy, jocks suddenly appeared behind me. They ranted and raved, saying some of the most offensive things that one could hear come out of another's mouth. 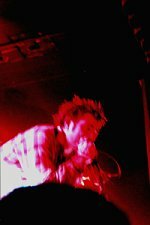 When Deftones let the music slow down, songs like "Mx" and "Dai the Flu", the cro-magnon's behind me screamed at the top of their lungs "BRING IT BACK!!! WHERE'S MY NOISE BABY!!!???". Oh, and believe me, I tried to block them out. But for some reason people like that just have a way of overpowering other people's sense of concentration. I thought all hope was lost when, suddenly in the midst of a song, Chino politely informed the crowd that he thought Deftones were "alternative" when they came out, but now he thinks they are "jock-rock". After a few mean glares from other members of the crowd, in addition to myself, the apes went to the back. Throughout the night, Deftones created such an intense atmosphere that one could not leave without feeling like he or she had just been through something. From the raw notes of "Engine No. 9" to the solitude of Just Chino and a guitar, singing the most beautiful song I have ever heard performed live, Deftones put on one of the best live shows to ever grace the mid-sized stage of La Luna. And I could sense the crowd felt the same way I did. One more thing...Did I mention how Chino surfed the crowd to the bar with his cordless microphone to get a beer during the encore performance of "Headup"?? Well, I guess you should have been there! !